SYEGON® is a Central Tire Inflation System that inflates and deflates tires while driving. Since 1986, SYEGON® is integrated in thousands of tactical or multi-purpose special vehicles; fielded in numerous countries all over the world. It is intensively used from Mauritania's or Argentina's Off-Road trails during Paris-Dakar Rally Race, to the Irak's or Afghanistan's hostile grounds. Genuinely developped to provide a solution to military demands with respect to safety, reliability and long life-time, SYEGON® is successfully used for civilian applications : Rallye-Raid, agriculture, fire-fighting trucks and special vehicles. SYEGON® CTIS is the best solution to automatically adapt tyre pressure depending on the vehicle speed, the load (3 levels) and the road nature (4 types). With the optimisation of the tyre footprint on the ground, SYEGON® increases the vehicle traction power, improving its mobility and consequently ncreasing passengers's security. - compliant to all the most recent military norms. - able to make real time tire pressure and temperature measurement. - isolation of damaged/flat tires in order to prevent emptying the air tank. SYEGON® is a compact system, easy to integrate and to customize. Since 1986, SYEGON® is used on thousands of tactical or multi-role military vehicles, which are fielded all over the world, from Mauritania's or Argentina's Off-Road trails during Paris-Dakar Rally Race, to the Irak's or Afghanistan's hostile grounds. 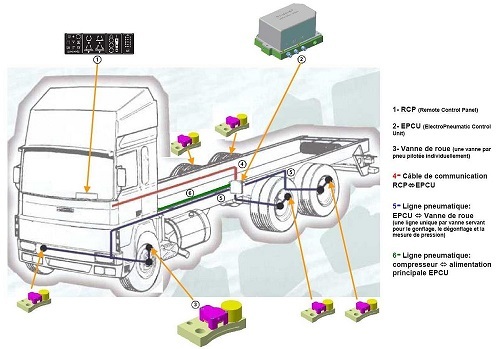 SYEGON® CTIS, Central Tyre Inflation System, allows the safest wheeled-vehicle tire pressure management for various applications, such as 4X4 All-Terrain Vehicles, tactical armoured trucks, Agriculture...). By an appropriate inflating and deflating of their tires, while they are moving, thousands of vehicles in operation all over the world, gain quicklly in mobility, whatever the environmental conditions (temperature, dust or pollution, humidity ratio). 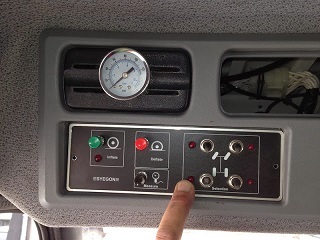 Choosing a type of terrain (out of 4) and a level of load (out of 3), the user changes automatically the target pressure of each tires, to a pre-programmed value (target pressure configuration stored in the EPCU, Electro Pneumatic Control System). Target pressure settings depends on the specifications of the vehicle. The axles of the vehicles can be given different target pressures for each combination Terrain/Load (Syegon® can handle 3 groups of axle). Target pressure are given for 4 types of terrain and 3 levels of load, i.e. 12 different values for each group of axles. Pressure are programmed according to the customer requirements. Any changes afterwards is possible whether by returning the product or by acquiring Syegon Diagnostic Software Tool.